Bring down the cost of your purchase with this fab discount. Browse a wide variety of products from a range of Racket Sports including Badminton, Tennis, Squash and Racket Ball where you can find all the equipment and accessories you could need at low, discounted prices with up to 30% savings. Where do I use my Sweatband voucher code? Go to the NetVoucherCodes website and click ‘Get Code’ on the deal you’d like to use. Click ‘copy code’ and then follow the link to the Sweatband.com website. Browse through their products and click ‘Buy Now’ to add items to your basket. When you want to check out, click on your basket in the top right-hand corner. You can paste your voucher code in the ‘Gift Vouchers’ box underneath your order. Continue to checkout to complete the payment. Turn your home into a suitable place to work out by investing in gym equipment. Sweatband.com lets you enjoy your favourite gym exercise in the comforts of your own home by providing you with the best exercise machines in the market. One quick way to get fit is by playing squash! As one of the most fast-paced of all the racket sports squash will give you a great cardiovascular workout, improving your stability, agility and flexibility too. At Sweatband you can find Squash rackets that vary in weight distribution, dimensions and strings, select one appropriate to your strength, speed and style of play as well as balls so you can hit the courts as soon as possible. In the Sweatband Squash section you can also find specialist footwear that will help your performance as you play as well as goggles; a worthwhile investment and often a required piece of equipment on some courts around the world. Sweatband.com offer Gym Equipment for both home gyms and the commercial gym markets. If you need gym equipment for you're home, unless you’ve got very specific training needs and goals, it'd be more practical to invest in strength training equipment that will deliver an all over muscle toning workout. This will save money and space, as you'll have one piece of equipment to do all your exercises rather than a few pieces. You could try a simple low space combination set of dumbbells and a foldable exercise bench, or if you want to use higher weights and not compromise your technique when you do so a multi-gym will guide you safely through the full range of high-level resistance training. There's also kettlebells- the lighter ones can be used first to elevate the heart and promote flexibility- while the heavier ones will build strength and stamina. Sweatband's Running department has a wide range of products for runners of all levels. Whether you’re looking for running shoes, clothes, hydration packs, water bottles, running technology or even treadmills, they've got you covered. From casual runners to those who train seriously and everyone in between, Sweatband has running shoes to suit all with everything from cushioned shoes to motion control shoes to aerobic trainers. They also have a comprehensive range of treadmills from leading brands to suit all requirements. At Sweatband runners can also order clothes specially designed for training purposes and those who like to measure their progress or monitor their heart rate will be pleased with the wide range of technology available such as running watches, GPS watches, heart rate monitors and other great devices that track, support and motivate your actions. With over ten years experience in the sports and fitness industry Sweatband pride themselves on their superb range of high-quality sports products and their unparalleled customer service. 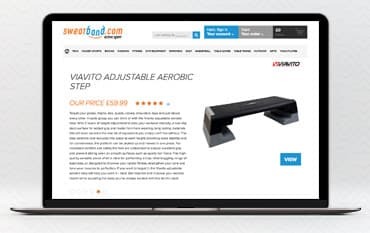 Sweatband are committed to providing the best possible deals online, if you find the same product cheaper somewhere else, let them know and they'll do their best to match it. Find all the sports and fitness products you could ever need with Sweatband, from racket sports to gym equipment to fitness items, they have it all! Shop their range of products from big brands like Puma, Reebok, TomTom and more and save money on your order with our voucher codes and deals!